Did you know the Rhone Valley is the 2nd largest French AOC wine area? Or that 27 different grape varieties are grown in the Rhone Valley? Or that Canada imports 6% of Rhone Valley wines in the world? There is a lot to like about Rhone Valley wines. Not to get too involved in the details of the area, it can be divided into a northern and a southern region, with the cooler northern being more well-known for Syrah wines and Viognier/Roussanne/Marsanne blends, and the warmer south for their Chateauneuf-du-Pape blends, rosé wines, and other white wines. I have written several articles about Rhone wines in the past. It is a favourite region of mine. I’ve travelled to France and made a point of stopping in the Rhone Valley. I was gifted two bottles of Rhone wines, one red and one white, to try, which are both available in BC Liquor stores. The white wine is from Louis Bernard, and the red wine was from Ogier. Ogier produces one of my favourite Rhone wines, Clos de l’Oratoire des Papes. You can read about my past experience with Ogier wines here. But let me tell you now about my tasting of Louis Bernard and Ogier Cotes du Rhone wines. 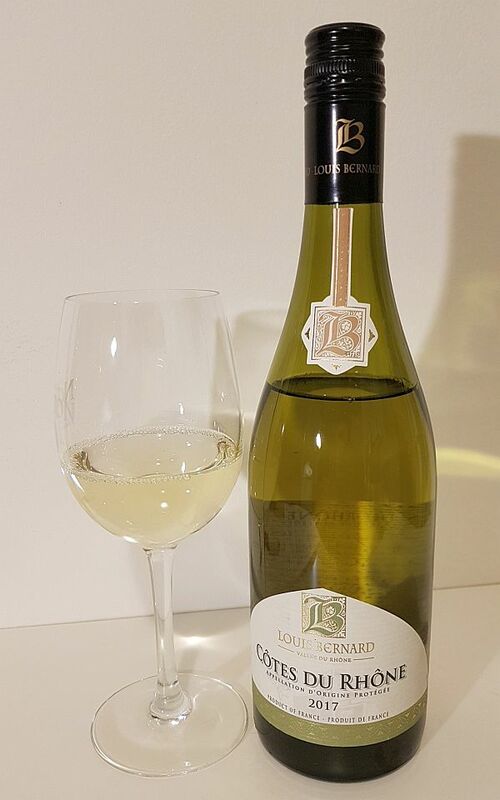 Louis Bernard Cotes du Rhone Blanc 2017 ($16.99) – This wine is a blend of white Grenache, Viognier, and Roussanne grapes. It is medium intensity bright lemon in colour. Medium intensity nose with nice green citrus, lime and grapefruit fruits, along with hints of white flowers, peach and bramble leaf. The wine is dry but does have a sweet edge to it. Higher levels of acidity, body and flavour intensity. I first noticed that the wine had a very mineral tone to it, but it did reduce with decanting. Semi-round with flavours of lemon and grapefruit primary, and some stone fruit and apple. Toward the finish the grapefruit flavour transformed to grapefruit pith, ending with pith and pepper on the finish. With decanting, I noted the minerality decreased, and I also was able to detect more peach flavour. I think the wine tasted a bit nicer without decanting. Rating: A bright, refreshing, lively wine with a variety of citrus flavours and some stone fruit added in the background. Seafood calling! 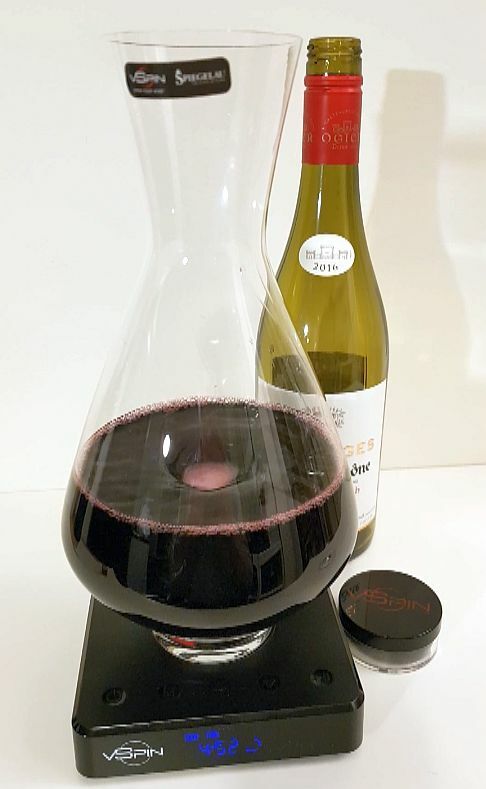 For the red wine, I used the vSpin Active Decanting System, to automate the decanting process in 3-5 minutes. They claim that 4 minutes of vSpin decanting is equivalent to 4 hours of decanting. I’ve tested it before on a bottle of Inniskillin Dark Horse Vineyard Meritage and did indeed see a difference. You can read the details of my vSpin decanting test here. But for the moment, let’s continue with this bottle of Ogier Heritages Cotes du Rhone red wine. Ogier Heritages Cotes du Rhone Grenache – Syrah 2016 ($17.99) – Medium translucent ruby plus garnet colour. A lighter intensity nose, that has lots of cinnamon aroma when first opened, along with lesser amounts of red fruit. The wine is dry, medium body and acidity, and soft tannins. The tannins do firm up a bit toward the finish and give the wine structure. Red fruits, sweet red cherries, and ripe blackberry flavours, along with a lesser amount of floral, vanilla and oak. The wine has a medium plus length finishing with tart red fruit, sweet spices and black pepper. 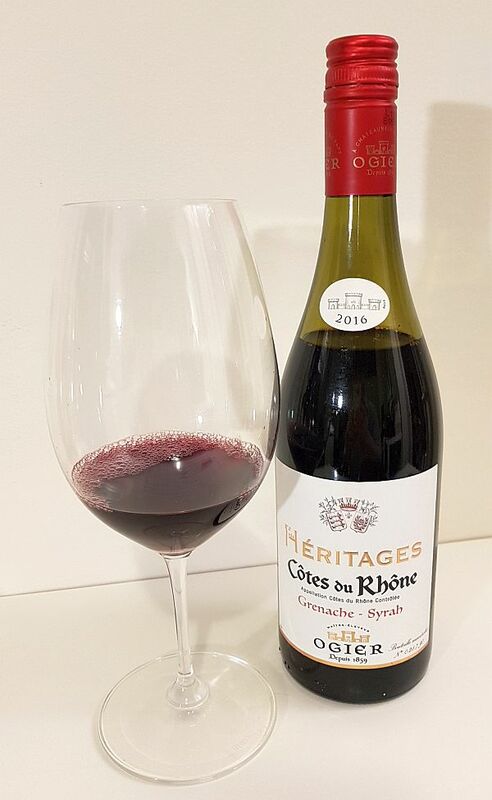 Ogier Heritages Cotes du Rhone Grenache – Syrah 2016 (with 3 minutes of vSpin decanting) – The cinnamon aroma was much lessened, and left the wine with more of a cinnamon toast aroma. More subtle nose. The wine has a rounder, thicker mouthfeel, with richer fruit flavours. The flavours are mostly red fruit and blackberries, now with a smoky oak component. The floral perfume is also reduced. The flavours on the palate remain the same as the undecanted wine. Ogier Heritages Cotes du Rhone Grenache – Syrah 2016 (with 5 minutes of vSpin decanting) – Same nose as with the 3 minute decant. On the palate, the wine is again rich and round in your mouth. The flavour profile changes; you get more red fruit and floral, and some blackberries. Light oak. The tannins are still fine, but get more pronounced on the finish. Tart fruit on the finish, with lighter intensity spices and black pepper. For this Ogier Heritages Cotes du Rhone wine, I rate them all between – . It is interesting how the decanting process brought out different flavours in the wine each time. ← The Best Food and Wine Experiences Napa Valley Has to Offer?